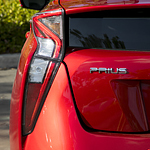 The special shape of the Toyota Prius helps it look beautiful and capture the attention of those who see it. That is not all that the special shape does, though. The shape of this vehicle helps it to move against the wind in an efficient and powerful way. If you want to add a little something extra to your Toyota Prius to help it have an edge, you should look into the available 17-in alloy wheels. These special wheels change the overall appearance of the car.